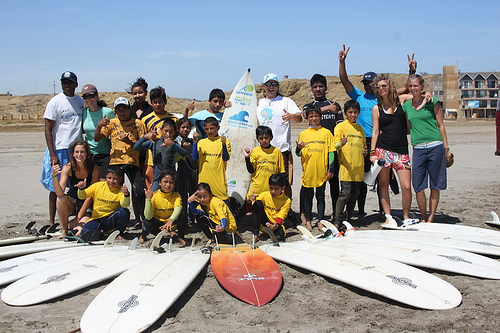 WAVES for Development creates life-enriching experiences in coastal communities through Educational Surf programs. These programs help develop local youth into healthy & empowered adults. They also engage travellers & transform their world view and appreciation of local issues. WAVES relies on volunteers, contributors and charitable donations to help deliver these programs. WAVES is a 501(c)3 tax-exempt public charity in the state of New York, USA. Additionally, WAVES is a formalised not-for-profit association in Peru and Switzerland. In October 2010 I am taking two months off work and travelling to Lobitos in Northern Peru to help WAVES with the program. In the run up to my trip I am trying to raise funds and awareness for WAVES. That is where YOU come in. Please help support WAVES by making a donation. Your money goes directly to WAVES (it doesn’t fund my trip) and helps them continue to carry out their important work within the communities of Northern Peru. $25 – The price of a surfboard leash for Educational Surf programs. $100 – The price of a wetsuit for Educational Surf programs. All donations are greatly appreciated, no matter how small the amount is. Donating through First Giving is simple, fast and totally secure.